After countless debates, theories, and non-human laboratory tests, it seems as though the bionic eye implants are finally going mainstream – first to hit the European market, and then hopefully to the US. The bionic eye implants are said to restore sight to completely blind patients – but only if the blindness is caused by a faulty retina, like in diabetic retinopathy, macular degeneration (which affects millions of senior citizens), or other degenerative eye diseases. Argus II, the first edition of these bionic eye implants, is already available in Europe. For about 93,800 EUR (115,000 USD), you can receive a four hour procedure to install and antenna behind your eye, and a special pair of camera-equipped glasses that send signals to the antenna. The antenna is wired into your retina with around 60 electrodes, generating the equivalent of a 60 pixel display for your brain to then interpret. The first human users of the Argus II bionic eye reported that they could see rough shapes and track the movement of objects, and also slowly read large writing. The Argus II was developed by Second Sight, a visual prosthetics company based in Sylmar, California, with offices in Switzerland as well. 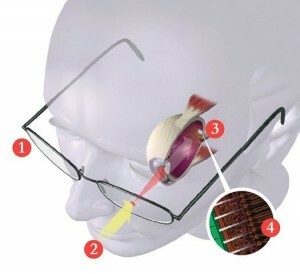 Bio-Retina, the second bionic eye implant, was developed by Nano Retina. The Bio-Retina costs a lot less, 48,900 EUR ($60,000 USD) and instead of an external camera, the vision-restoring sensor is actually placed inside the eye, right on top of the retina. The implant procedure only takes 30 minutes and can be performed under local anesthetic. This is the one I’m really excited about. With patients suffering from macular degeneration and diabetic retinopathy, the light-sensitive rods and cones in their retinas stop working. The Bio-Retina gives you a 576 pixel resolution sensor right on top of you damaged retina, and 576 electrodes on the back of the sensor implant themselves into the optic nerve. An embedded image processor then converts the data from each of the pixels into electrical pulses that are coded in a way that the brain can translate into different levels of grayscale. The very best part though, is how the sensor is powered. 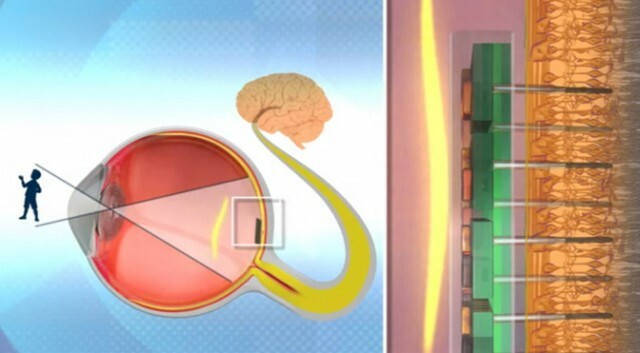 The Bio-Retina system comes with a standard pair of corrective lenses that modified so that they can fire a near-infrared laser beam through your iris to the sensor at the back of your eye. On the sensor there is a photovoltaic cell that produces up to three milliwatts of power – just enough for the Bio-Retina to operate properly. The infrared laser is invisible and considered harmless. Human trials of the Bio-Retina are set to begin in 2013 – but just like the Second Sight Company, US approval could still take quite some time. But it’s relatively simple to just fly over to one of the European clinics offering bionic eye implants – especially if you can afford a $60,000-$115,000 operation. 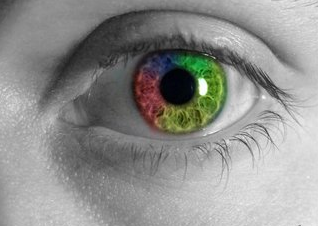 In the future, many research organizations will be working bionic eyes with even more electrodes, yielding a higher resolution as a result, but there doesn’t seem to be any progress on sensors or encoder chips that can successfully recreate a color image. A lot of progress has been made in understanding how the retina, optic nerve, and brain process and perceive images, but we still have a long way to go. But who knows what the future has in store?